Tomorrow sees the launch of Blacker’s new yarn, Cornish Tin, which is the celebratory cherry on top of their 10th Anniversary cake. 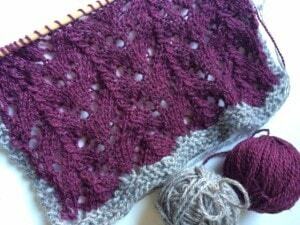 Thanks to a lovely advance preview of this yarn I was able to knit up a lovely big swatch and give it a little review. You can hear that review in episode 39 of the KnitBritish podcast. Since then I have washed and blocked the swatch and I wanted to share this wonders of this wool with you a little further. The yarn comprises of 10 breed fibres which have been chosen for their softness and lustre and includes Alpaca, Gotland, Jacob, Shetland, Black Welsh Mountain, Mohair, and English Merino, to name but a few. Available in five colours – one natural and four bold toning shades – the yarn is going to be available in both 4ply and DK, in 100g skeins, for a very limited time only to celebrate their 10 year milestone. Knitting with this yarn I was struck by the smooth, bounciness of the yarn in the skein. I would say that the DK is slightly loftier than the 4 ply and has a lovely soft halo of fibres over the yarn. I started my swatch with a few rows of garter in the levant grey DK and immediately fell in love. You know me and garter stitch! Four rows in and I was thinking the grey would be the perfect MC in Kirsten Bedigan’s Evremond shawl, perfect for all that garter and brioche rib! But I was good….I nipped the need to just do garter stitch and I switched to the 4ply in Wheal Rose Red to try out some lace. The yarn was smooth over my needles, but has an amazing grip too – no doubt that stickiness due to the wondrous blend of sheepy fibres! I really loved how it knitted. 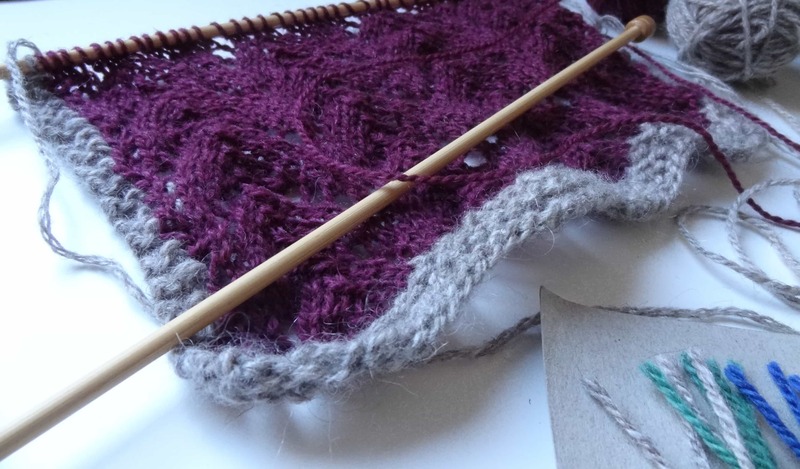 With a lot of woollen spun yarns you don’t usually get a high definition on the stitch but I also think that the mix of high lustre yarns really helps with that – I really love the lace, especially now it has been washed and blocked. I was limited a wee bit in blocking in that my larger blocking mats are in use, so this could have blocked a lot larger than the 11 x 11 inches it is. That bounce I mentioned in the skein means that it has a lot of stretch in it. Perfect for larger lace items. The bloom on the DK garter edging has come out as fantastically as I hoped so there could definitely be more Cornish Tin garter in my life…maybe an Age of Brass and Steam or a Drachnefels? However you don’t need to swither over patterns as there are three free patterns over at Blacker which have been designed with this yarn; two fantastically textured hats and some colour-work mitts. Cornish Tin comes in DK (100g/220m) and 4ply (100g/350m) and costs £12.90. The yarn will be launched tomorrow on the Blacker Yarns website. If you want to try this out you need to be quick because it is a truly limited edition. 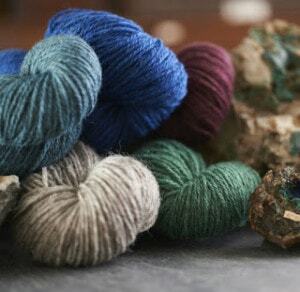 Just think of the special knits you could make in this yarn; A yarn which speaks volumes of our wondrous British breeds, or sustainability, of expert yarn craftsmanship and of a company committed to all of those things! A very happy 10th birthday Blacker. 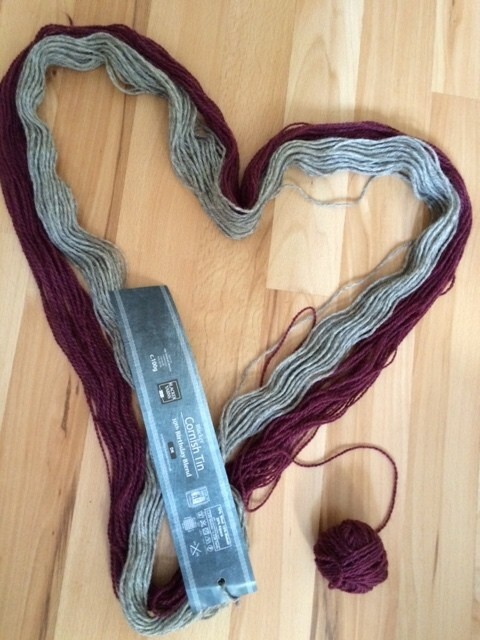 KnitBritish hearts you, big time. What an elegant salute to the humble sheep! Can’t wait to try it!